Today we have an extraordinary sewing room to share with you from one of our readers, Laurie Guidry. 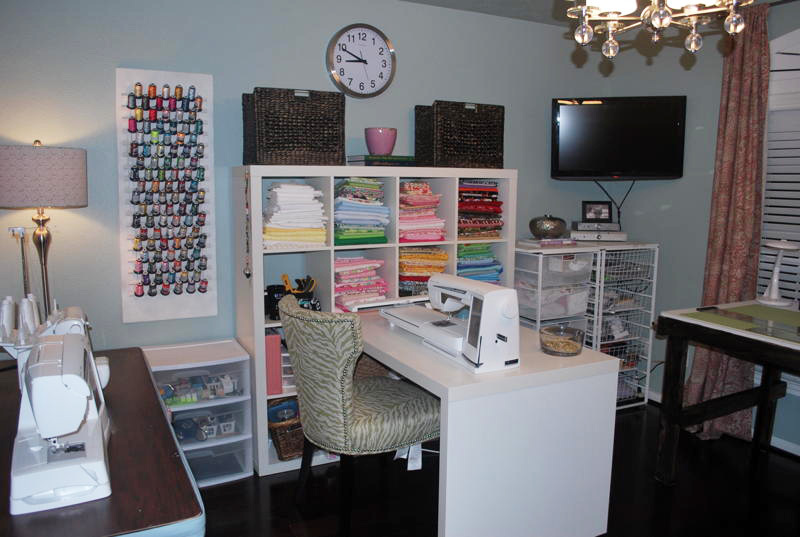 Lucky Laurie attended our February School of Art Fashion earlier this month, and when she returned home, she had a beautifully redecorated and organized sewing room! Drool over her space with us - it is sure to be a bustling hive of inspiration and creativity for Laurie from now on. When I went to School of Art Fashion in Huntsville, my niece and her mom, my sister-in-law, completely redecorated and organized my sewing room. What I had before was a jumbled mess of hand-me down furniture, stacks and stacks of fabric, boxes of mixed up laces and other trims. Add to that my patterns, my Sew Beautiful magazines and Martha Pullen books and what I had was one huge mess!! When I got home, I felt like I was on one of those decorating TV shows and had won! I love my room. It is a beautiful soothing color and all of my fabrics folded and color sorted look like an amazing piece of art. My niece is very gifted in design and my sister-in-law is the organization queen. What a blessed month February was. A full week with all of my sewing family at the Martha Pullen School of Art Fashion, then to come home to such a beautiful sewing studio. It doesn't get much better than that!! I wonder if I go to Huntsville again this summer is the design & organization fairies will come and redo the rest of my home....probably not, but it's a fun thought. 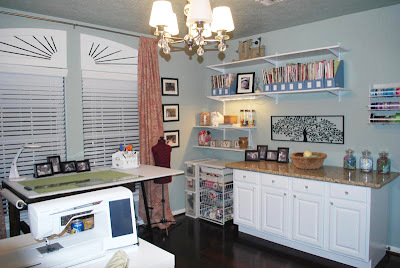 Enjoy your gorgeous space, Laurie – and happy sewing! 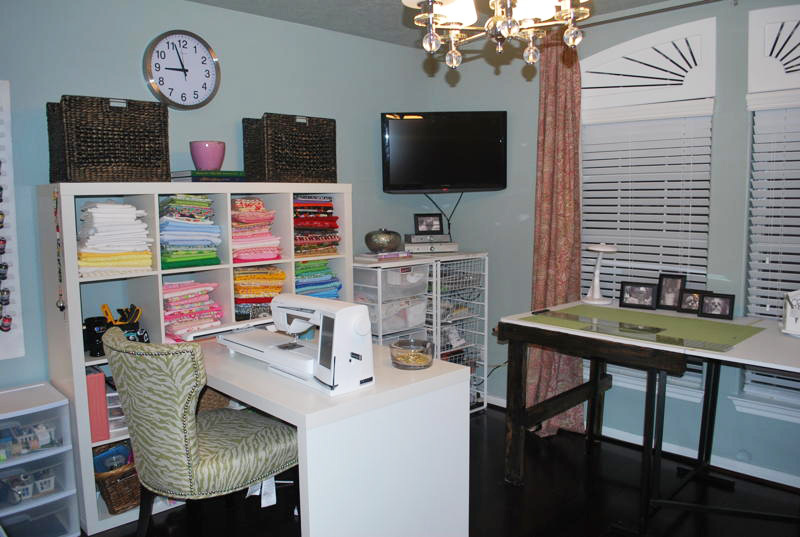 Do you have a beautiful sewing room you'd like to share with us? Send your pictures to blog@sewbeautifulmag.com. That is gorgeous! I can't wait to do the same to my sewing corner. One of these days when I'm out of the city, I'll have my own sewing room. But for now I'm working in a tight space. My sewing/knitting stuff is shoved in a corner of our master bedroom (which we share with dd age 9 months)......To sew I have to unearth the sewing machine and chair. That space is beautiful. I hope to have something like that someday! How do I hire them to redo my sewing room??? How beautiful and so well organized!! 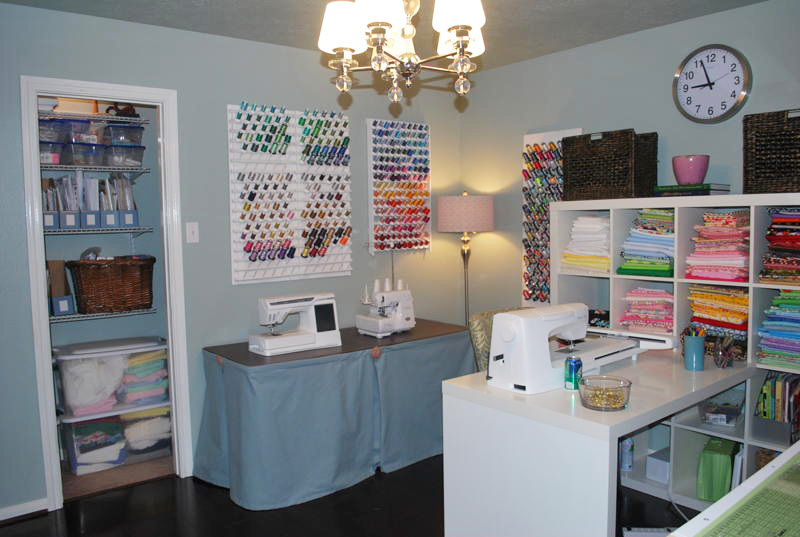 Just got my first sewing room... not quite as neat as this one but those pics have inspired some organization! I love the fabric on display! Thanks for sharing! Laurie, I am so happy for you! You are a very blessed lady to have a neice and sister-in-law who think enough of you to make this effort for you to be able to enjoy your love of sewing! These pictures have inspired me to make some changes to my sewing area and display more color. I am very impressed. Happy sewing! Would she share the source of the white cube shelving? I recognize some Elfa storage, but I love the cubes. Fabulous room! and what a great, loving surprise! You watch how your productivity soars, Laurie, in your new digs. It worked for me. There is nothing like organization to free the mind for creativity. Enjoy your new space! Angela, the cubes with the desk were purchased at IKEA Kimber - my niece is for hire, but we live outside of Houston. That is beautiful! I wish there was an IKEA near me. Thanks, I have been to the Houston Ikea a few times. My son and family live in Humble. I know they also ship. It's beautiful, and the colour is so soothing. May I ask, what is it that you have on a roll at the end of your cutting table? The paper on the roll at the end of my cutting table is the paper that doctors use on the beds in their offices. I talked my husband's neurologist out of the roll. I use it to trace patterns so that I can use them over and over again. When I am wrapping gifts, I can just change out the paper and then I have a great work surface for that as well. Want to submit something to share on our blog? Feel free to send us an email to the above address for consideration.